Input voltage - 230V / 110V Input power - 220V(7.1kva) 110V(5kva) Current range - 220V(10-160a) 11..
Current Range = 20-160A DC Max Open Circuit Voltage = 56V Duty Cycle = 130A @ 60%, 160A @ 40% Mai..
Technical Data Input Voltage - AC230V - 50/60Hz Input Power (kVA) - 6 Current Range (A) - 10 -14..
Technical Data -Input Voltage - AC 230V 50/60Hz , AC 115V 50/60Hz -Input Power (kVA) - 8 , 6 -Cur..
Key Features -TIG Pulse AC/DC with digital control -Digital display -Program memory storage -Eas.. Input voltage - AC 230V - 50/60Hz Input power (kVA) - 9.4 Current range (A) - 10-200 Duty cycle @..
Infinitely variable output up to machines max setting Super smooth DC welding output MMA stick wel.. 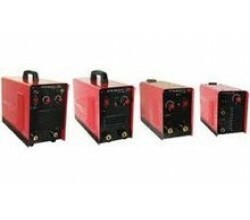 Input voltage 230V/110V - 50/60Hz Input power - MMA 7.1kva / Tig 5.2kva Currant range 230V- MMA (1..
Voltage = 220 volt (single phase) Input Power Capacity = 5.1 KVA Output Current Range = MMA 10-160..